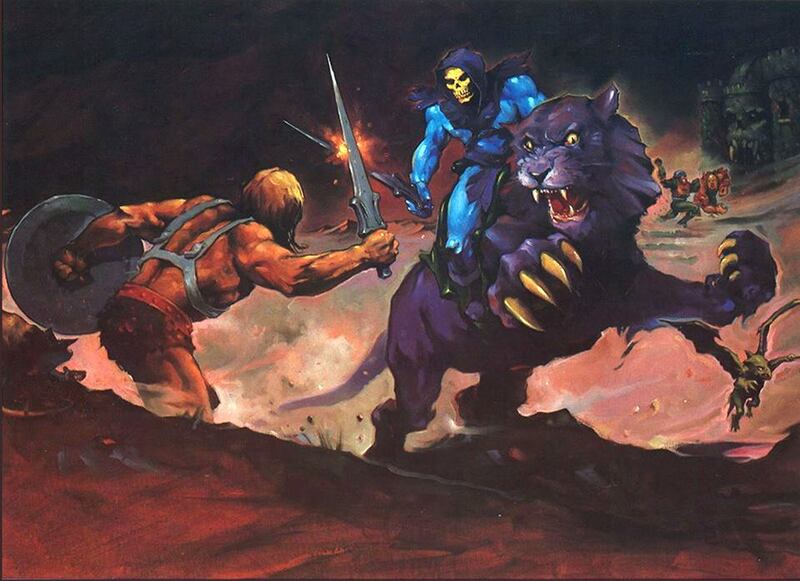 Today we’re taking a look at Skeletor’s savage cat, Panthor. At first glance you could dismiss him as a cheap Battle Cat repaint without the helmet. When I first saw him as a kid, it was immediately apparent that that’s what he was. 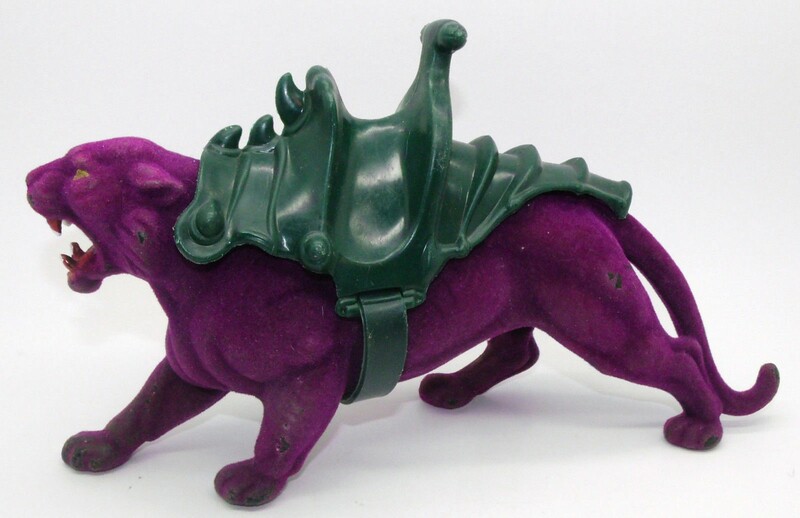 Battle Cat’s pose and saddle are instantly recognizable, making reuse of his sculpt more obvious than other parts (say, for instance, the standard male chest). I think if Mattel had left him as a straight-up repaint, we as kids might have felt a bit cheated. 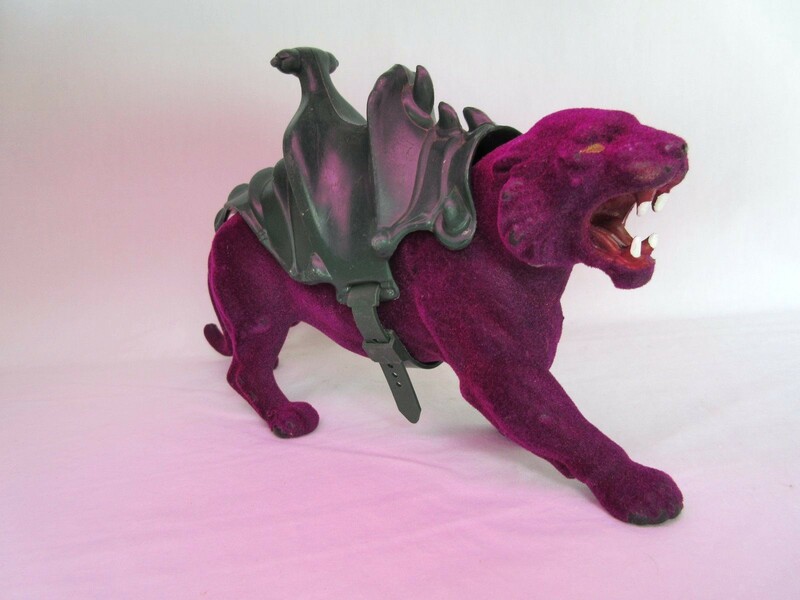 Wisely they opted to produce Panthor with some short flocking, giving him a realistic furry texture and making us feel better about spending our allowances on him. 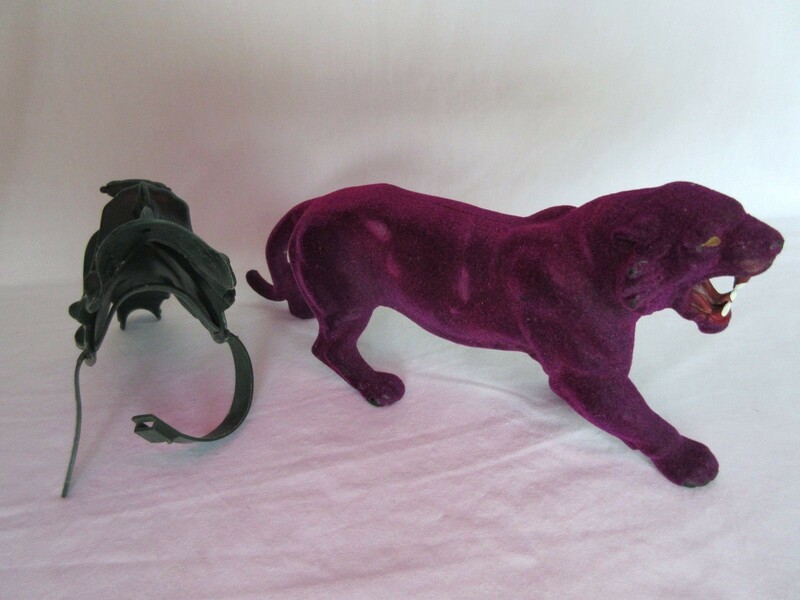 Instead of just a an inferior copy of Battle Cat, Panthor became a deluxe toy with realistic fur. What kid could resist that? 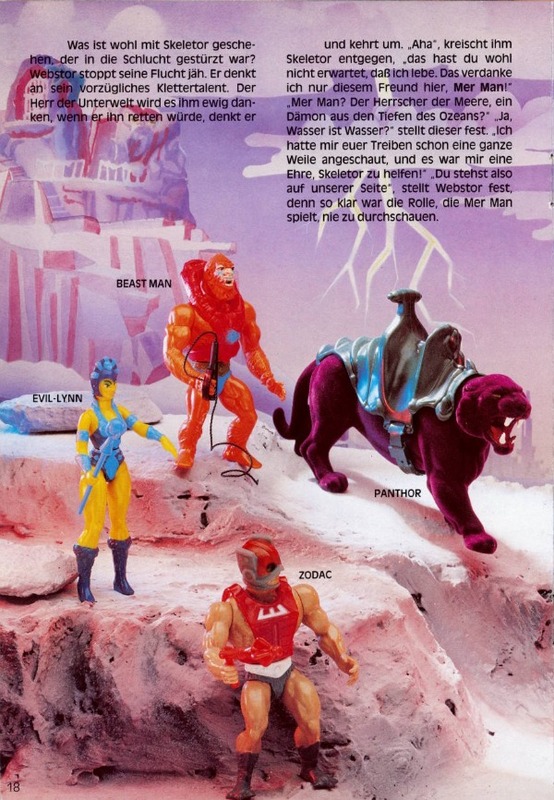 In retrospect it was wiser (not just cheaper) to omit the helmet, which is probably Battle Cat’s most distinctive feature. 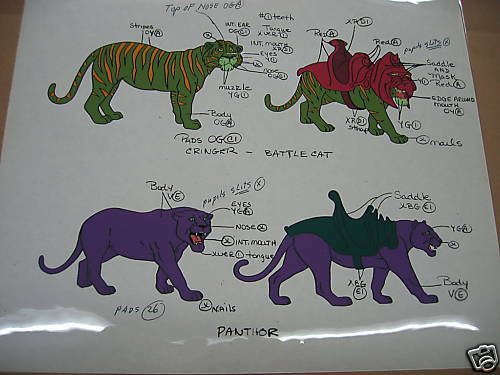 Panthor’s final color scheme was chosen by Mattel designer Martin Arriola. 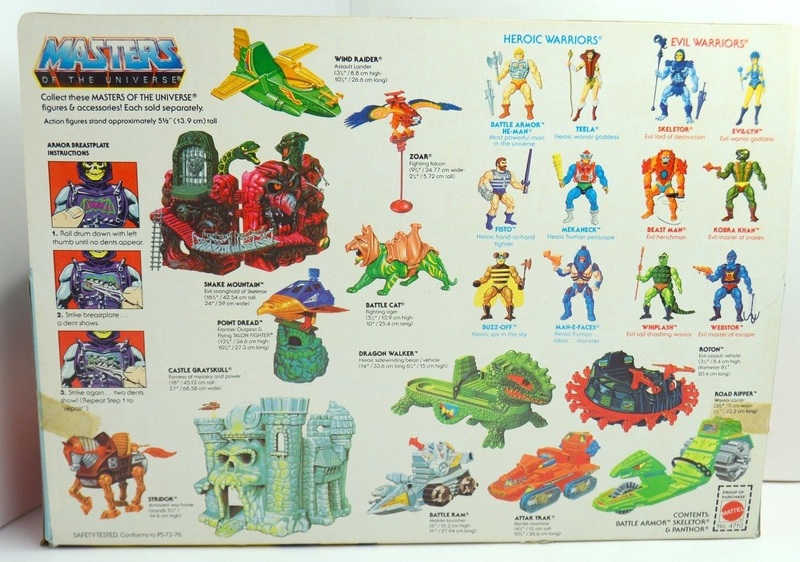 Garland did box arts for Mattel after Rudy Obrero but before (and concurrent with) William George. The style is very much along the lines of Rudy Obrero’s (that is to say, moody and Frazetta-like). That’s probably why I like it so much. 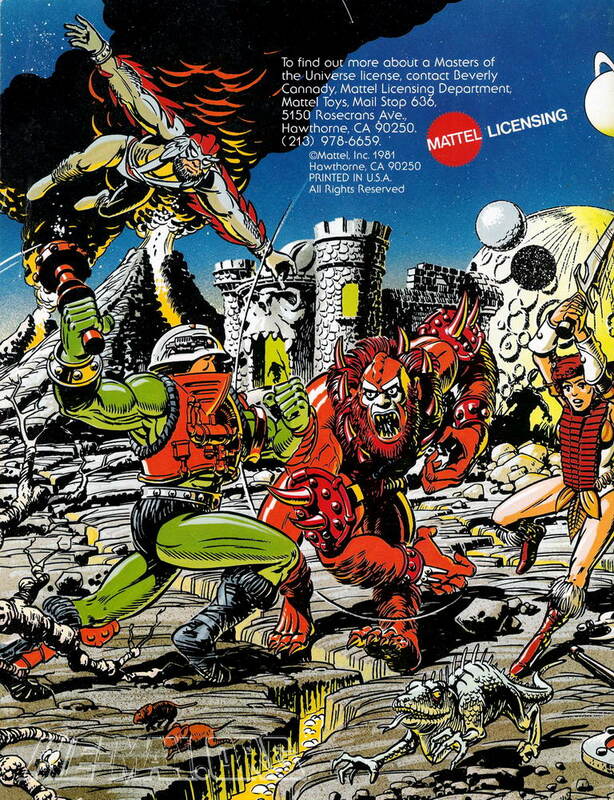 The pose you see for Beast Man and Man-At-Arms comes straight out of the 1981 Licensing Kit. Thanks to Jukka for pointing that out to me! 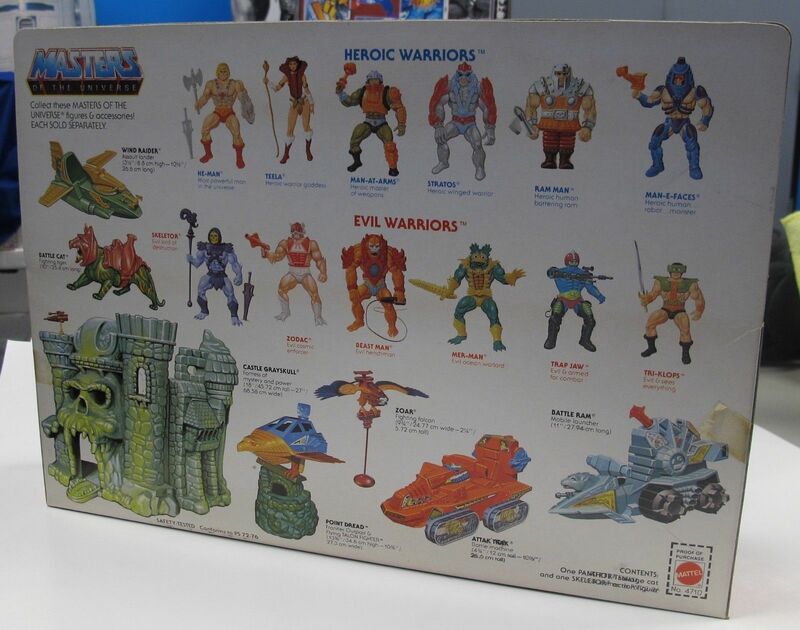 Image via He-Man.org. Artwork by Errol McCarthy. 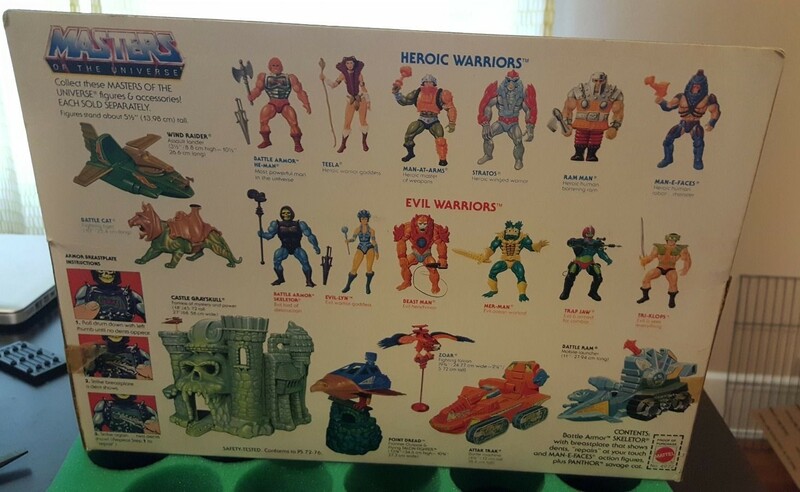 This set featured Skeletor, Panthor and Man-E-Faces, and might be my favorite of the Panthor box arts. 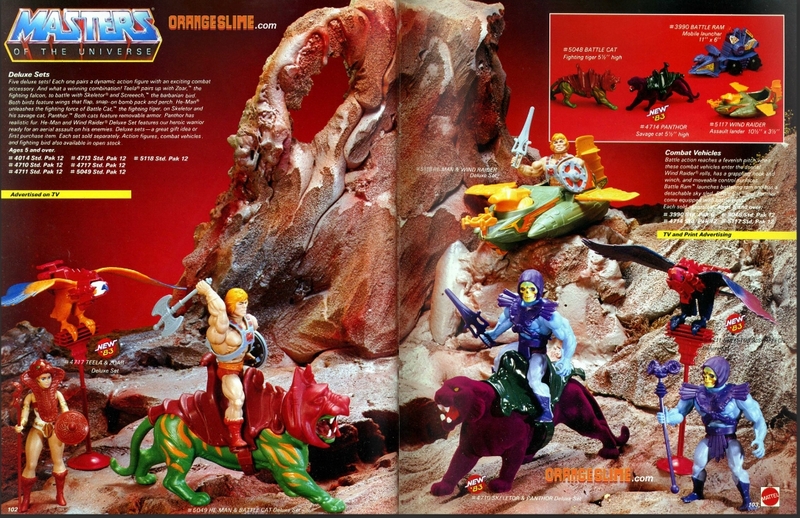 It’s something about how Man-E-Faces is portrayed and the craters and moons in the background, I think. 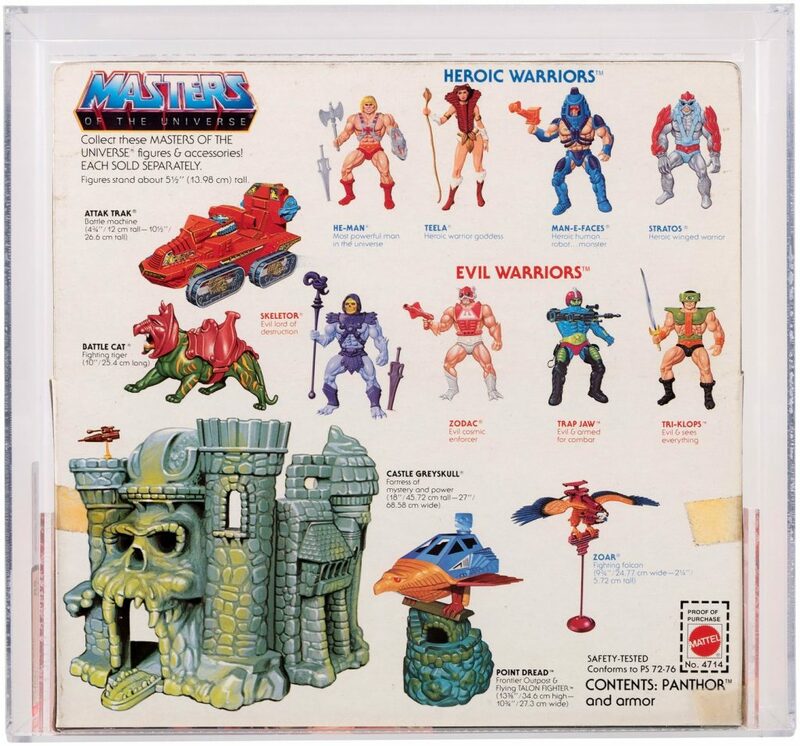 There were two versions released: one with the standard Skeletor, and another with Battle Armor Skeletor, presumably released in 1984. 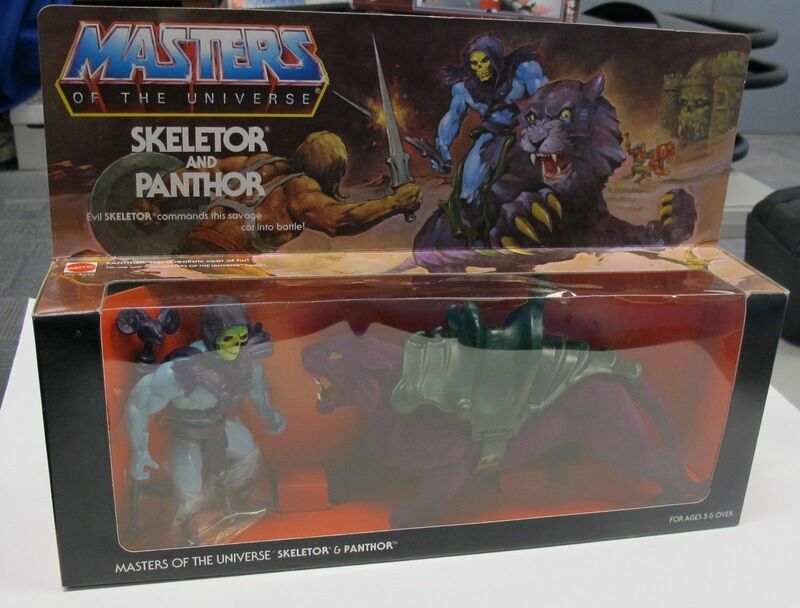 A year after Panthor’s release, Mattel was apparently considering releasing a deluxe version of Panthor, with articulation and some sort of pouncing action feature. This July 13, 1984 illustration by Ed Watts demonstrates the concept. 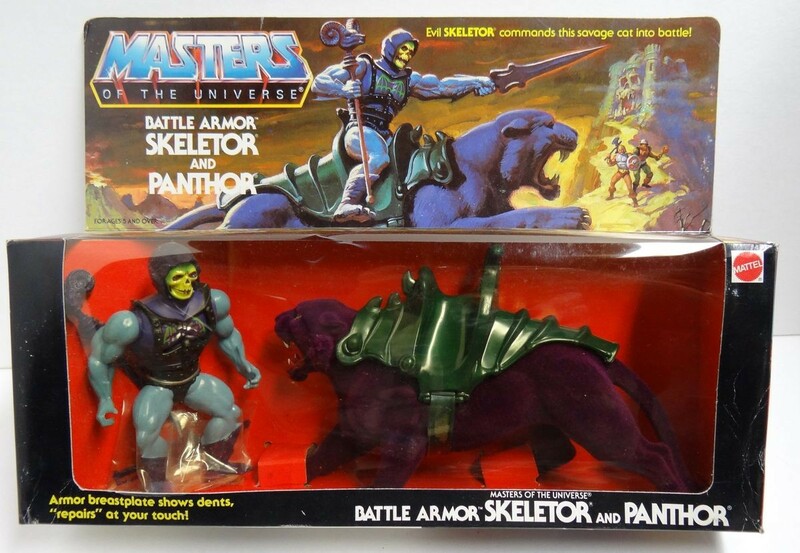 This version of Panthor was, unfortunately, never released in the vintage line, although the 200x version wasn’t far off from this idea. 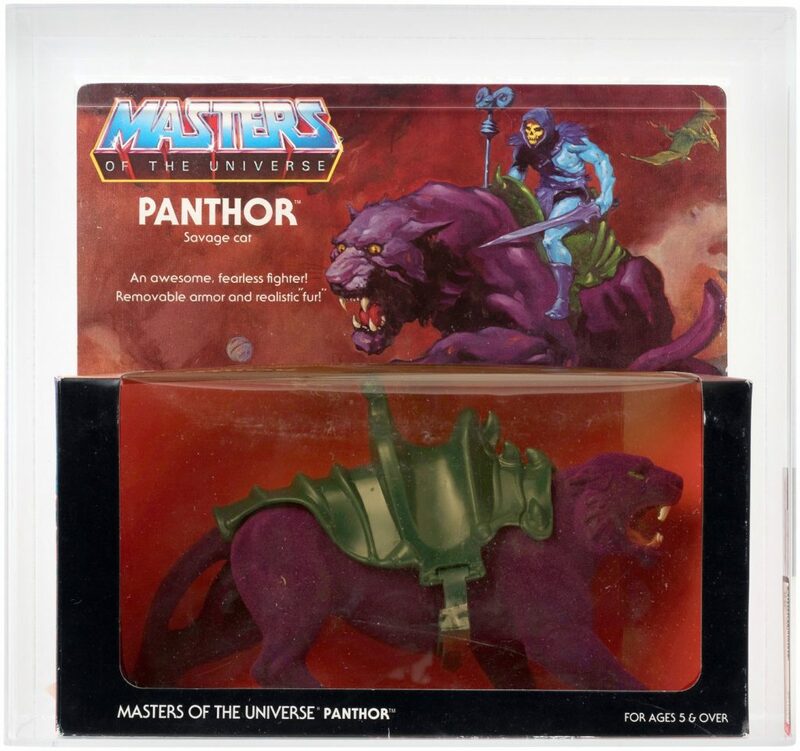 In the finalized Filmation version of Panthor, he looks very much like the vintage figure (with green eyes), except for the fact that they’ve cut back on the extra fur around his face, giving him an appearance more like a real panther (ignoring the fact that he’s oversized, purple, and domesticated enough to wear a saddle). 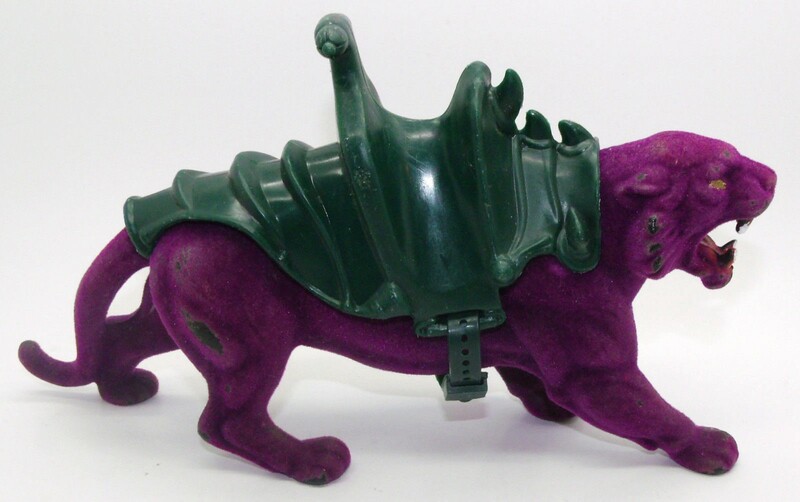 Panthor was on of the first in a series of evil opposites in the Masters of the Universe toyline. 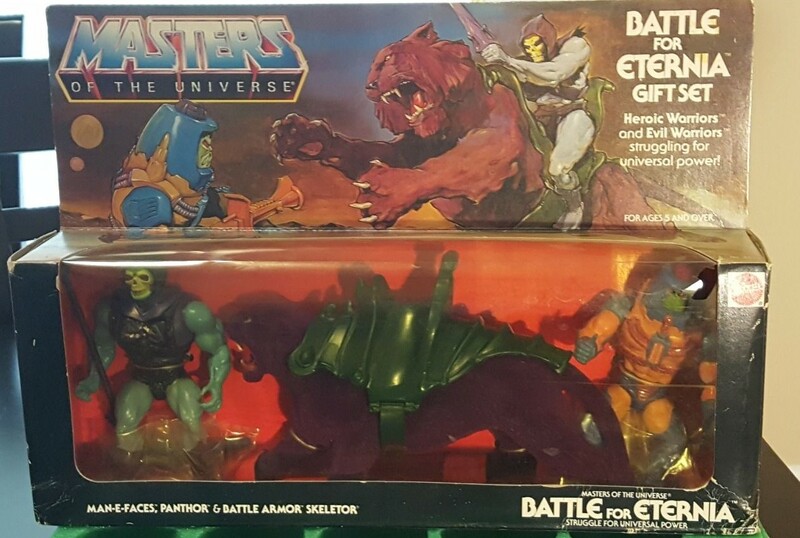 Battle Cat had his opposite in Panthor, He-Man had his opposite in Faker, Zoar had his opposite in Screeech, and Stridor had his opposite in Night Stalker. It was a fun and creative way to refresh existing molds. The goal was undoubtedly to maximize profits, but in the end it’s amazing what can be accomplished with a simple change of colors. Great job with this post. 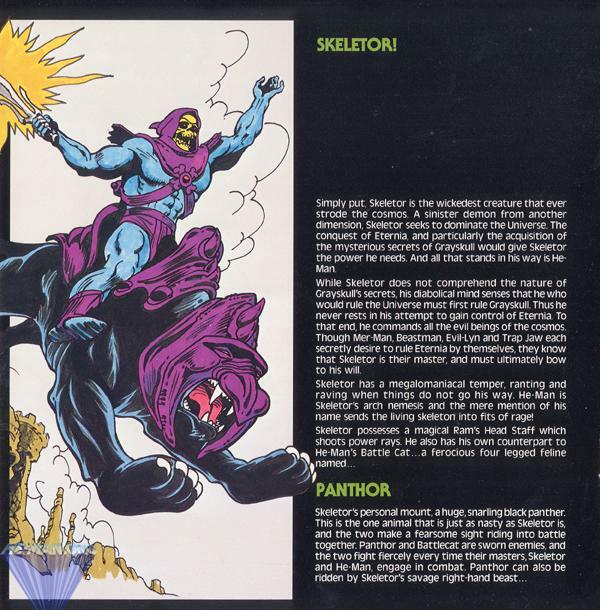 Love reminiscing about Panthor’s box art. 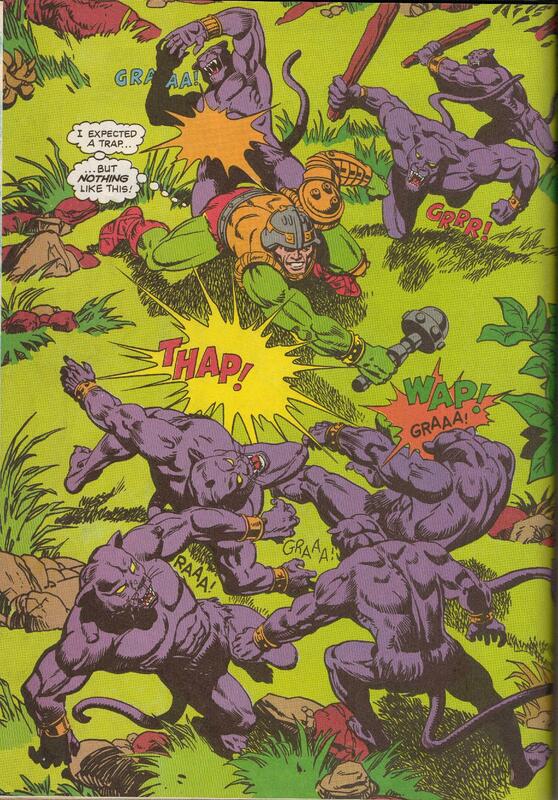 The various writers never really tapped into Panthor as much as I wanted them to (and never mind Screeech*). 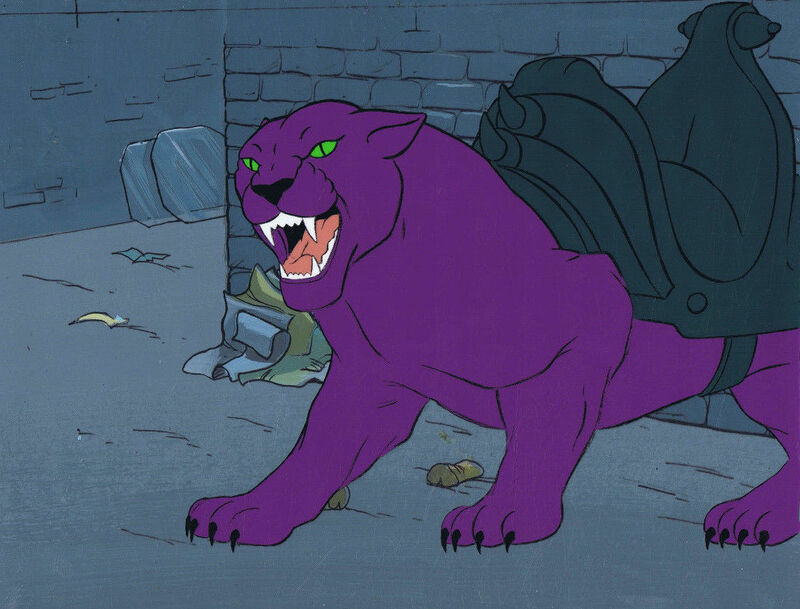 If Battle Cat was Cringer, who was Panthor in his free time? 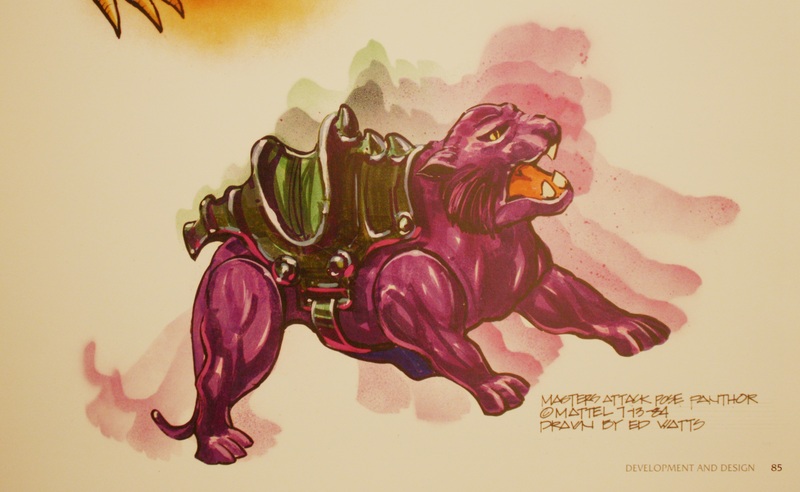 If Cringer could speak, why couldn’t Panthor? Anyway, those were the issues I had with his treatment back in the day. I liked his figure a lot, although my rug lint got all over it, and I somehow lost his saddle, so he pretty much looked like my grandmother’s puma statue. *Best treatment was when I read Evil Lynn was Screeech as The Sorceresses was Zoar. Right, the lack of symmetry was a bit weird. As you point out, even Screech got a little bit of development as the alter ego of Evil Lyn in the Sunbird Legacy and in one of the audio stories. 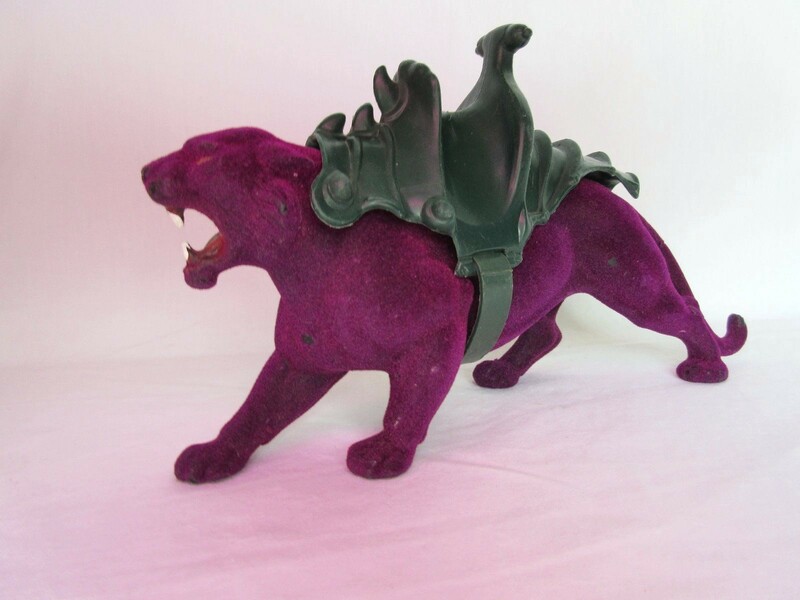 Panthor was treated like an ordinary steed. 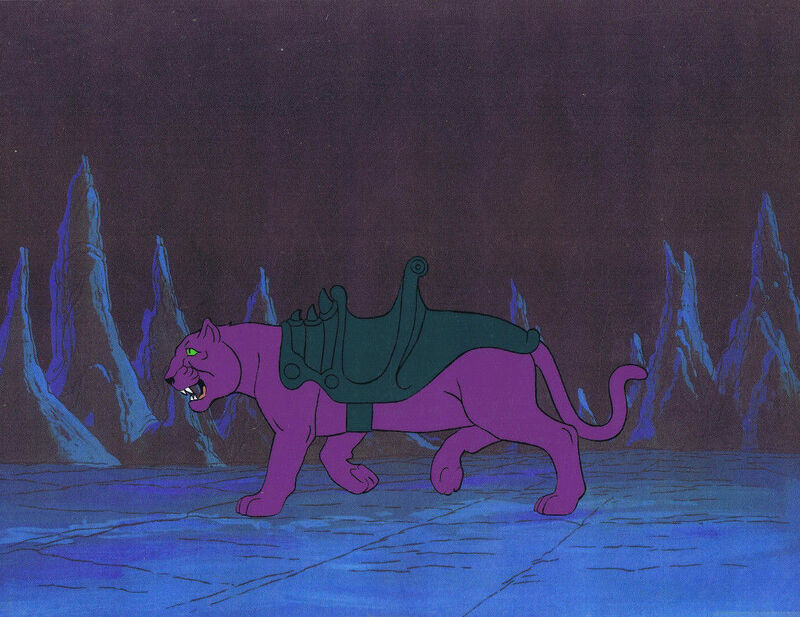 Yeah, I kinda wish that Panthor was shown to be intelligent like Battle Cat. The Classics one of course has a newly crafted helmet with giant horns, but sadly lacks the flocking. 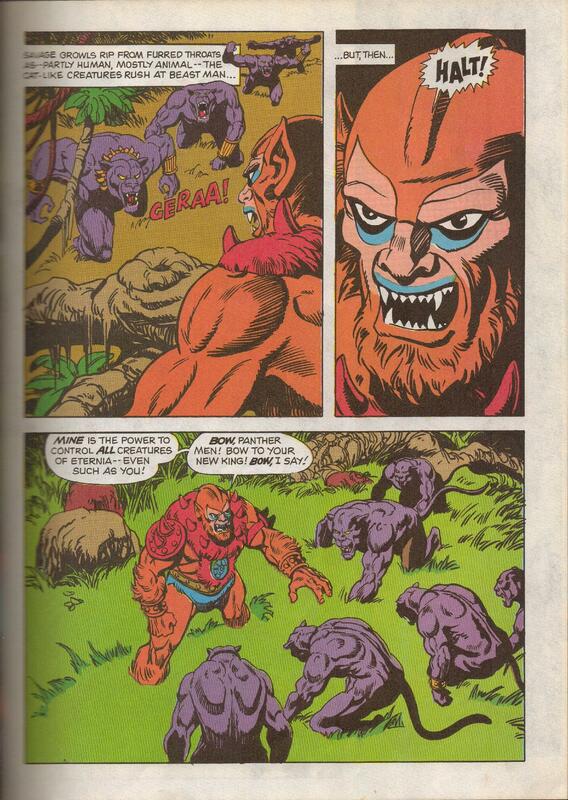 Poor Panthor: he had to compete without any kind of help against an enhanced tiger on magical steroids. 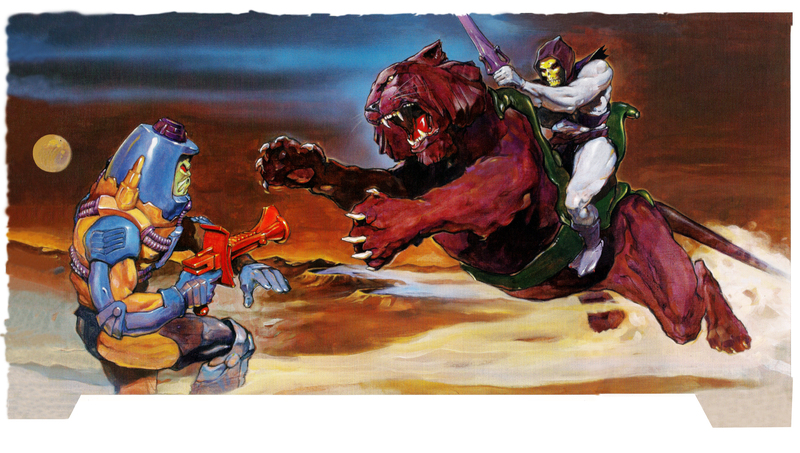 However I like that Panthor is simply a beast and does not talk (as I like that in the first mini-comics Battle Cat is the same); I think that they made Battle Cat into a talking tiger mainly because in the cartoon He-Man needed someone to speak with to explain the situations for the little viewers. 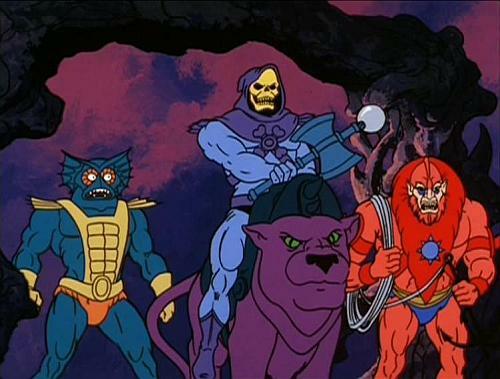 Skeletor had his henchmen to speak with, so Panthor ended up as a simple animal. I always like the softness of Panthor!